Charles Nathaniel Haskell, Democrat. Served from 1907 to 1911. Oklahoma's first State Governor was born March 13, 1860, in Putman (note: probably Putnam) County, Ohio. He was educated as a lawyer, admitted to the Ohio Bar in 1881, and began practice in Ottawa, Ohio. In 1901, he moved to Muskogee, Indian Territory, where he added to his law practice the promotion of railroads. He was a leader in the Oklahoma Constitutional Convention in 1906. After his term as Governor, from November 16, 1907 to January 9, 1911, he engaged in the oil business. He died July 5, 1933, and is buried in Muskogee. Charles N. Haskell was born in Ohio, December 13, 1861. At the age of sixteen he began to teach school, continuing for several years. While teaching, he began the study of law. After being admitted to the practice of law, he settled at Ottawa, Ohio. He also became interested in railway construction. In 1900 he settled at Muskogee. He became prominent as one of the leaders of the Sequoyah statehood movement. In 1905. The next year he was elected as a delegate to the State Constitutional Convention, in which he wielded a powerful influence. In 1907, he was nominated by the democrats as their candidate for governor and was elected and inaugurated as the first Governor of the new state. In 1912, he was an unsuccessful candidate for the democratic nomination for United States Senator. After leaving politics he became interested in the oil business. He moved to New York City, where he died on July 5, 1933. He was removed to Muskogee, Oklahoma where he is buried.. He constructed two railroads while living in Ottawa, Putnam County, Ohio. His first was the Findlay, Fort Wayne and Western; started in 1888, finished in 1895 and sold to the C.H. and D. in 1902. The second was the D. T. & I. railroad constructed in 1895-1899. C.N. Haskell's father died when Charles was three years of age, at the age of ten he went to live with a couple named Miller where he lived until the age of twenty years of age. Though Mr Miller was a school teacher, Charles was unable to attend school regularly, but Mrs. Miller taught him at home. At the age of seventeen he passed the examination for a teacher's certificate. Haskell taught school until after he was admitted to the bar in December 6, 1880 at the age of 20. When his school term ended, he moved to Ottawa, Ohio to practice law. He married Lucie Pomeroy, daughter of a prominent Ottawa family, on October 11, 1881. Lucie Haskell died in March, 1888, leaving Haskell with three children. Haskell remarried Lillian Elizaberth Gallup in 1889, the couple had three children. His energy eventually brought him into Oklahoma politics, where he became a commanding figure in the Oklahoma Constitutional Convention in 1906. In March, 1907, Haskell began publication of The New State Tribune which brought him even more prominence. On Nov. 16, 1907 President Roosevelt signed the proclamation admitting Oklahoma as a state. 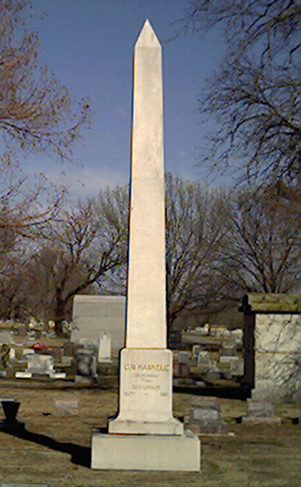 The same day Charles Nathaniel Haskell was inaugurated as the first Governor of the State of Oklahoma. The Haskells moved to Guthrie, living in the Royal Hotel. Haskell's daughter, Frances married the editor of the Guthrie Leader, Leslie G. Niblock in March 1909. In 1933 Haskell suffered a stroke, from which he never fully recovered. He died three months later of pneumonia on July 5, in the Skirvin Hotel in Oklahoma City at the age of seventy-three. The first capital city of Oklahoma was Guthrie. The New State Tribune was located in Muskogee, Oklahoma. A Resolution expressing regret at the death of the Honorable C. N. Haskell, First Governor of Oklahoma; commending him and his patriotic unselfish service to the people of the State of Oklahoma; extending the sympathy of the members of the Fourteenth Legislature and the people of the State of Oklahoma to the bereaved family; authorizing the Speaker of the House and President of the Senate to appoint a committee of five members of the House and the Senate to attend the funeral, and directing the Senate Auditor and the Chief Clerk, of the House to arrange for a suitable floral offering. Again we are called upon to note that the writing hand moves on. This time Oklahoma's distinguished citizen, Charles N. Haskell, her first Governor, has passed into the Valley of the Shadow. Departing, he leaves an honored name, a cherished place in the memory of all Oklahomans. He has gone to consort with the patriots of all time and of every nation. Of his early life we know but little but we do know him,—and we are satisfied with the result. Born in Ohio in 1860 he took up his abode with us in 1901. Arriving at Muskogee he found a grown up country town. What appeared insurmountable to others became to this man of action an opportunity. Reared on a farm and reveling in the great outdoors and having a native genius for construction he became a town builder; built street car and inter-urban lines and promoted and built railroads. Started a Tide Water project from Ft. Gibson for the purpose of establishing lower freight rates for his adopted town. Commodious hotels, stately business houses, new additions, improved streets and a city of homes and a greater Muskogee were his gift to his community and to the State. This constructive genius could not be satisfied with mere mechanical results, but these were the harbinger of a highly developed inward urge and a lofty call to public service. He founded the New State Tribune, made this newspaper the sponsor of a statehood movement that was to arouse the nation. Having set himself industriously to this great task he never faltered. The result was the Sequoyah Convention advocating separate statehood for Indian Territory. As such it was a challenge to Oklahoma and to the American Congress. It became the unanswerable argument for Statehood. The Statehood bill was passed and Governor Haskell became a prominent figure in the twin territories. He was one of the chief organizers of the Constitutional Convention, during which he formed associations with the leaders who were to control the destiny of the new state and he established a life-time alliance with delegate William H. Murray, who was made President of the Convention. As a delegate he was a diplomatic organizer, a great harmonizer, a pacificator, and the friend and confidant of the entire membership. He wrote many of its sections and took active part in every deliberation. As First Governor of Oklahoma he did more than occupy a station. He comprehended those broad principles and a mastership of the almost infinite detail essential to sound policy and to wise public administration in a situation requiring profound understanding and fraught with infinite peril. His administrative triumphs were a literal example of the "Survival of the Fittest in the midst of a Hostile Environment." His administration began November, 1907, with Statehood, and concluded with the convening of the Third Legislature in January, 1911. A lawyer by profession with an uncanny understanding of the requirements of the hour, the needs of the people, a keen interest and a discriminating comprehension of public needs and of state welfare,—his inaugural address at Guthrie, delivered on the south steps of the Carnegie Library, lifted him into national prominence. He set about the vitalization of the Constitution and the organization of the State on constitutional lines with such vigor and superb policy that the Forty-sixth became the radiant and attractive star of the American Flag. During the First Legislature Governor Haskell delivered a message and conjoined thereto a resolution creating a commission to thunder at the door of Congress and to awaken the various states of the American Union to the transcendent importance of amending the Federal Constitution to provide for the election of United States Senators by direct vote of the people. The result was electrical and the impact was irresistible. The decisive character of Governor Haskell, his quickness to act and his inimitable ability to grasp information and solve difficult situations were never better illustrated than in his personal canvass of the votes, summoning the public officers, and requiring them to bring the great Seal of the State and meet him at Oklahoma City where he declared the result and the world awakened to find at Sunup following the election that the officers were beyond the venue of the Guthrie lawyers and judges and that Oklahoma City was the capital of our State. Throughout his administration as Governor, and more especially in his service on the County Seat and County Division Committee of the Constitutional Convention, his practical mind, his intuitive knowledge of the law, and his insight into what the law should in fact be enabled him to discern the underlying principle at issue. He found the middle ground and usually brought belligerent forces and rival interests into friendly compact. The people of the State owe to him a deep and permanent debt of gratitude. Contenders over county seats and over county boundaries, towns demanding new institutions, special privileges snarling at being disturbed, lobbyists and corporate clamorings for legal advantage, innumerable popular demands, office hunters and hungry politicians seeking place and a salary, a solicitor's face in every window and a demanding hand at every door encamped around about him and each and all had their hearing. Like every good-hearted man he often conceded too much and sometimes made serious mistakes, but his constant concern was to conserve the best interest of the State and send the disappointed solicitants away with a feeling that a denial was either a personal favor or a state necessity. In a high degree Governor Haskell became a national character. Oklahoma's progressive constitution, his activities in its formation, his administrative wisdom and energy, his dramatic personality, his peculiar aptitude and rich endowments silhouetted his outline on the national horizon. He was a Democrat in politics, in principle and in affection. He trusted the people and his standard rule of conduct was to espouse no cause he could not defend before the people. Although a railroad promoter and builder, he was the unbiased and fearless advocate of their rigid regulation. In public life his services were not given to clients, nor to retainers, nor to advertising patrons, nor to those who had employed him, and in public life he came, not to get or to demand, but to give and the generosity of that gift was superb. With boundless energy he worked twenty hours a day, giving himself and every ounce of his capacity to the public welfare. He cared not place, except as a means of service. In 1908 he headed the Oklahoma delegation to the National Democratic Convention at Denver and for a few months was Treasurer of the Democratic Campaign Committee. He was the real co-laborer and in spirit and in fact the spokesman for William J. Bryan in writing the platform of that Convention. In 1920 he again headed the Oklahoma delegation at the National Convention, which in that year met at San Francisco and as such was committed to and faithfully labored for Oklahoma's own United States Senator, Robert L. Owens, for the nomination for President. In 1928 he was a delegate to the National Democratic Convention at Houston. In 1932 he was the Oklahoma Patriarch at the Chicago Democratic Conclave. At each convention and in his speeches and in numerous articles appearing in the public press he disclosed an intimate understanding of the big money masters of America and ruthlessly exposed many of their venal practices and their corrupt usage of the public funds in their own interest to the detriment of the people. In private life he engaged in activities which made and lost several fortunes and in those processes made fortunes for others who prospered by his counsel and advice. In his family relations he had an outstanding reputation for love and respect to his own wife, and most tender consideration for his children. He is survived by his wife, Mrs. Lillie E. Haskell, his daughters, Mrs. Frances Edmondson and Mrs. Jane Richardson. He loved and adored them, they reverenced and honored him, and we share their deep and genuine sorrow. Some expression of insight into the character of Governor Haskell is not only befitting but should serve a high and exalted public purpose. In public office he was free from corruption. Though he was the leader in the deliberations of the committee on county lines and county seats when hundreds of towns had committees attending the sessions with heavy purses, yet he left its deliberations lean and poor and by the time he had retired from the Governor's office he had become utterly impoverished. Upon the platform and in debate he ignored the elements, arts, and graces or oratory but marshaled facts, arrayed statistics, and piled up figures and illustrated events in unsurmountable mass, connecting them with pungent sentences, abounding in stinging sarcasm, cutting wit and with a grim humor that carried his point. He possessed a deep insight into human psychology based on a reverence for public duty which is best demonstrated in his selection of the first judges of the Court of Criminal Appeals when he selected for its members Judges Henry M. Furman, H. G. Baker and Thomas H. Doyle. He declared that though he deemed knowledge of the law of vast importance in a court dealing with the liberties of the citizens, but rising above and far beyond this elemental necessity that the public welfare prescribed that this court should be composed of men of the noblest human impulses and a rich and abiding sympathy of heart. Living, Governor Haskell was an example of Oklahoma's lusty advent into state sovereignty; in death, he moves with solemn majesty into a deeper recognition of his worth. He was an explorer, yet he lingered to give permanence to his discoveries. He was more than a pioneer, he established and gave reality and enduring value where he wrought. He lived to see his work accepted and enjoyed by the legatees of his favor. His associates recount with ever increasing pride their co-labors with him, and his works arise and call him blessed. It is as "C. N." the battler that the world best knows Governor Haskell. Rough, ready, rugged old fighter, his entire life was beset with contests and his character molded for conquest. He had a hot temper, admirably regulated, a genuine love of debate, coupled with an abundant readiness to enter into battle for public principle. When in action his personality seized the imagination and held the affections. He could fight without hating. He would say anything in the category to, or about, an antagonist; yet, the man never lived whom he would wilfully libel or scandalize. He would denounce, but would never traduce. He considered that cause lost which had to be defended by defamation of character, and regarded a victory won by lies as a personal defeat. In his armory there were no poison gas, no poison arrow. He occasionally made flank movements but his favorite method was by direct frontal attack. The passage of many winters over his head, the challenge to battle on many a stormy front did not lessen his ardor nor quench his desire to meet life's responsibilities with his rugged face set firmly toward the goal. No human has ever seen this man of blood and iron falter, but heroic in strength and sublime in courage, as he met the tasks of earth, we know he answered the summons with that calm which he met every issue of life. Days of toil and nights of waking." Our friend will walk the way with us no more and while Oklahoma's flag is at half mast and our citizens sorrow and his family mourn, it is more a grief for ourselves than for him. That his last earthly consciousness should have been on July 4, like that of Thomas Jefferson, it is a fitting close to a life of patriotic service. Is this the end of life? Does love and sacrifice lead but to the grave? No, no. Blessed assurance. Even the space allotted to his pensive dust is now and forever shall be a hallowed spot, a shrine for the people of our state, yea for every true pioneer. Hope, tender and persuasive whispering to the soul bids the mourner to raise his eyes from the dust of earth to the heavens that bend above him. The sky begins at the ground and ascends to infinity. This earth is one of the stars. Time is a throb of eternity, life a heartbeat of the infinite. Indestructibility is the first law of nature. Forms perish, their substance persists. The written records of man reveal the lives and events of antiquity. The "memory of nature" holds in sacred vigil the processes of God through the lapse of ages. The constructive force of unselfish and noble lives can never die. They pass from generation to generation. They animate and inspire the hearts of nations yet unborn. Will the works of man and the story of man persist longer than himself? No structure is as great as its builder. The act is not greater than the actor. The composer is greater than his noblest anthem. "Death is but a path that must be trod, if man would ever pass to God." Let us so live that by the performance of duty we may prove that his example and his devotion shall not have been in vain, and that upon our part we shall be esteemed worthy of the several stations we assume to fill, and may it be our portion to share a like affection in the hearts of our fellow men. The Findlay, Fort Wayne and Western Railroad had as one of its promoters an Ottawa leader, Charles N. Haskell, who was to become the first governor of Oklahoma when it was admitted to the Union in 1907. Haskell was in Findlay often in connection with the promotion and construction of the railroad. When a former Findlay man who had moved to Toledo was indicted by the grand jury there for some alleged offense, he decided to "take off" to Oklahoma, where he felt a friend of his earlier days in Findlay would protect him and keep him from being extradited back to Ohio. The friend was Oklahoma's new govenor. The man went to Oklahoma and his surmise was correct. Ohio's efforts to bring him back via the extradition route failed. 1. Alt. Death: Oklahoma City, Oklahoma. Alternate death location for Charles Nathaniel Haskell. 2. Cemetery: Green Hill Cemetery, Muskogee, Oklahoma. Green Hill Cemetery is located at 1500 North York Street, Muskogee, OK 74403. The cemetery telephone number is 918-682-0331. Charles Haskell is buried in block 123-0, Lot 003-0, space 001-0. The cemetery records also state that he died of Pneumonia in Oklahoma City, Oklahoma. The plot purchaser's name was Mrs. C.N. Haskell.